Beautiful Reclaimed Timber Hairpin Table. From quality new, used and reclaimed timber. This table will look great in any kitchen or office. We choose our timber carefully then sand to a nice smooth finish taking care to leave as many imperfections as possible to show the age and character of the wood. 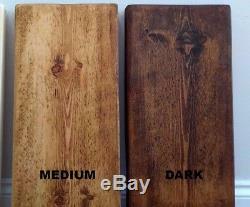 The tops are then sealed with a high quality wax and buffed to give a warm rich but mat tone. 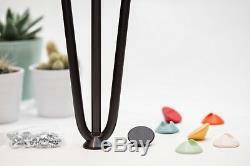 The Hairpin legs are made from 10mm high quality steel and are extremely sturdy. We even offer legs in a variety of. Colours, please see the photo below for details. This is our'Wide' range which at 90 cm wide is designed for average rooms. For smaller spaces and computer desks we do a Slim Range at 68cm wide. 90 x 90 cm Seat 4 People. 120 x 90 cm Seat 4/6 People. 140 x 90 cm Seat 4/6 People Comfortably. 160 x 90 cm Seats 6/8 People. 180 x 90 cm Seats 6/8 People Comfortably. 200 x 90 cm Seats 10 - 12. Sizes are approximate and may vary slightly. Because we hand make these table in our workshop we can offer custom sizes and finishes so if you wanted a particular colour or size then please let us know. 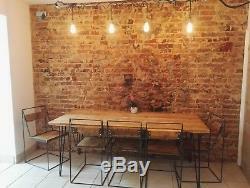 Tables height is 76cm (Approx - Inc Table Top). Leg Height - 71 mm (Approx). Available in dining tables, desks, coffee tables and benches. Each table is custom made to your requirements, for this reason it takes us a few days to prepare and build your table. Have a chat with Us. We take pride in our products and want to ensure you get the table that is perfect for you. For that reason we encourage you to ask us anything you like and will happily answer your questions or discuss custom designs and finishes. Thanks for looking at our products. Excellent product and good value. Received in advance of estimated date. The perfect table and a trustworthy company who are quick to reply to anything. Absolutely thrilled with my table! Every effect is made to match all colours and finishes but as wood is a natural product there may be variations in colour, grain pattern and shade. Being handcrafted there may be slight differences in size between products of the same description. All dimensions specified are approximate. Timber may form splits or shakes occasionally. This is part of the natural ageing process. They are not detrimental to the performance of the product and in our opinion add to the character of the product. If you wish to return all or part of your order you must notify us by telephone, within 7 days of receipt of your goods, and obtain a Return Authorisation Number. Please ensure the Return Authorisation Number is marked on the outside of the package and can be clearly seen. The item "Vintage Retro Hairpin Leg Industrial Rustic/Kitchen Table/Computer Desk WIDE" is in sale since Sunday, November 18, 2018. This item is in the category "Home, Furniture & DIY\Furniture\Tables\Kitchen & Dining Tables".